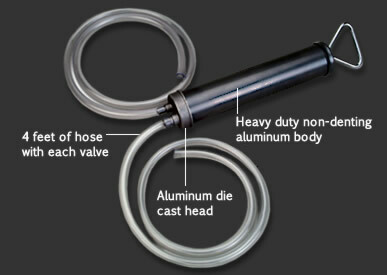 SAE Products® dual direction transfer gun draws in and pumps out liquid in a single stroke. Gun body is made from heavy duty non-denting aluminum. Suction head & piston have an aluminum construction & use Viton piston rings. Recommended use includes fuel oils, mineral oils, synthetic oils, petrol, cooling liquids, water, antifreeze, brake fluids, and more.